Miyamit Falls Trail Marathon (MF42) 2016 | JustRunLah! 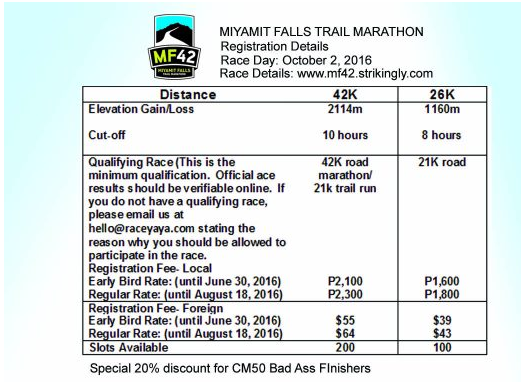 Registration for the Miyamit Falls Trail Marathon is now open! MF42 is part of the Clark Miyamit (CM50Ultra) Trail Race Series. The race provides a glimpse of the finale race, the longer and tougher CM50Ultra which is held towards the end of November each year, November 27, 2016 for its 6th Edition. The race has attracted runners of all abilities for a rare chance to visit the iconic Miyamit Falls by traversing the route is mostly fire trails, dirt road and single track trails. Runners shall go through lahar, dirt roads and a hilly route with a picturesque view of Pampanga, Mount Arayat and mountain ranges. The 42k runners will go through a long ascent of single track trails, an old trails used by the Aetas, towards the “peak” (3kms near the caldera of Mt. Pinatubo) .The iconic Miyamit Falls is the last turnaround point for both distances before heading back to the finish line. Even the elites take some time to snap a photo and get a dip in the cold water for the last push towards the finish line. Qualifications and preparations are both required for both distance which gives 2114m and 1160m of elevation gain.loss for the 42K and 26K, respectively. Cut-off times are imposed with the shorter distance 26K given a more generous time as new trail runners are expected to join the category. With the right preparation, MF42 is an ideal venue for those who would like to venture into trail running. “Trail running seems to be the organic progression from road races because of its inherent natural attraction to humans”, Race Director Atty. Jon Lacanlale said. For seasoned long distance trail runners, the race is an ideal conditioning/training race or a time to test their limits. For everyone, it is the time to go back to nature, enjoy the beauty the course offers and surpass the challenges the route shall serve. Finishers of the race will get finisher’s medal, meal and shirt.